The big ol’ Summit is coming up! The Summit, brought to you by the amazing people who run the Diamond Challenge, is totally focused on youth and entrepreneurship and providing a unique and life changing experience to any aspiring high school entrepreneur. 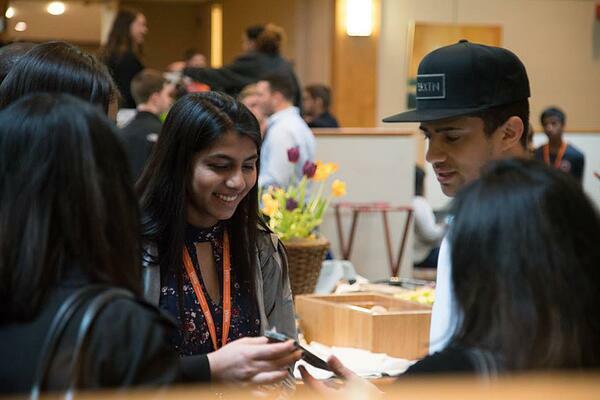 Visit the three day conference and enjoy meeting other young entrepreneurs, dancing with new friends and speaking to successful entrepreneurs. The global pull of the Diamond Challenge Summit is nothing short of incredible and that means new friends from all sorts of places. Kelly Landis, a Diamond Challenge Ambassador and current Entrepreneurship & Technology Innovation major, said “The diversity at The Summit is just so special. Seeing people from so many different countries who were all driven, passionate, motivated people who wanted to share their thoughts on ideas was really eye opening and exciting. The people I met are really interested in using their talents and entrepreneurship to create positive change in the world.” Sounds great! But let’s take a step back for a minute, because if we are being real, meeting so many new people all at once can be a tad overwhelming. But don’t stress, Sierra Ryan-Wallick, another Diamond Challenge Ambassador, adds her thoughts below. Every Summit attendee will be able to meet many successful entrepreneurs and get the chance to speak to them one on one. Enjoy feedback on your idea from a qualified expert or simply get some advice for your surely lofty career goals. As Horn Entrepreneurship’s very own Zack Jones, author of The World Changer’s Handbook, said “Entrepreneurship teaches you how to add value to the lives of others. Once you have that skill, the sky’s the limit.” Attending The Summit definitely puts you one step closer! Enjoy some of the hottest music cooked up by the one and only DJ Amaze with your new friends. Step out of the shower and (put your clothes on first!) let us all hear that voice you have been keeping under wraps! Break out your own moves on the conference floor or find some direction and improved health with a wonderful Zumba class on offer. Remember, The Summit was designed for you, to be enjoyed by you! Take the opportunity to meet new people and open your eyes to new ways of thinking. The three-day conference will be an amazing place to meet a community full of motivated young professionals who are ready to make their mark on the world! Get a head start and sign up today to enjoy the full range of benefits Summit has to offer!